Personalize your office by decorating basic office supplies. If you're a teacher, a uniquely-you decorated tape dispenser will let everyone know it's yours! This concept would make a great gift too. We've combined double-sided red liner tape with Kreinik Iron-on Threads and fabric scraps for embellishing a plain, common item. Turn your iron onto the highest heat setting and let it heat thoroughly. 1. 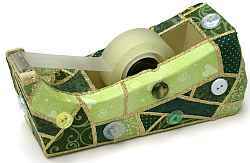 Cover your entire tape dispenser with pieces of the 8" x 10" Treasure Tape. 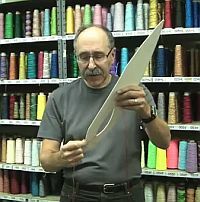 You may need to cut up pieces, layer, and carefully arrange the tape to cover all areas. 2. Remove the red liner exposing the top sticky layer. Begin laying fabric scraps to resemble a crazy quilt. 3. 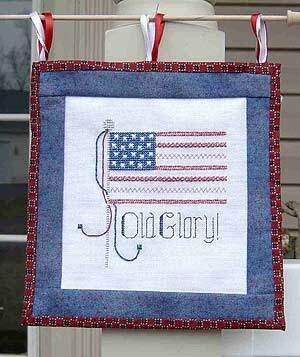 When fabric pieces are set, create the crazy-quilt seams by laying pieces of Iron-on Ribbon. 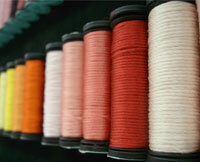 Lay the thread at a starting point, cover with the Press Cloth, and press for several seconds until the thread adheres. Continue this way until your design is complete. 4. 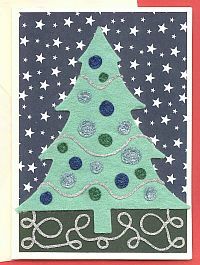 When thread decorating is finished, lay Treasure Tape dots in various places. Remove the red liner and attach buttons. 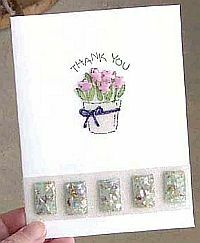 If you have trouble printing this page and would like us to send you a printed copy send a #10 SASE to: Quilted Tape Dispenser, P.O. Box 1258, Parkersburg, WV 26102.